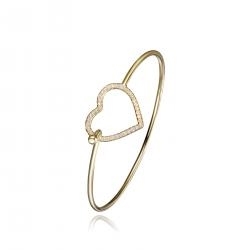 Diamond Essence Bangle Bracelet with Round Melee set in Heart shape, 0.50 Cts.T.W. in 14K Plated Sterling Silver. Diamond Essence Bangle Bracelet with Round Melee set in Heart shape, 0.50 Cts.T.W. in 14K Gold Plated Sterling Silver.